Who are you? How often are you at baseball games? Ian Sagabaen of Redwood City, but born & raised in San Jose. During the 2013 baseball season, I attended more than 30 games in Oakland, a handful during Spring Training, & a few games in Arlington & Houston on a baseball road trip. The aim is to make it to at least one game per homestand every season. What is your professional background and how it led to the creation/branding of "Greatest Sign Maker" and your A's posters? My day job is a user experience designer for tech companies in the Bay Area, but my design career started in high school where my interest in graphic design began. I gained my Bachelor's degree at San Jose State University in Graphic Design & minored in Photography. An early part of my career has been designing in Photoshop, & I loved it! When I watch ball games on TV & see fans in the crowd holding home-made signs, I figured that I could do something similar. My very first sign was a hand-drawn one that took hours to complete. It's easier & faster for me to design things on my computer these days. In December 2012, I won an A's Twitter contest & was awarded the opportunity to throw out the ceremonial first pitch. To encourage all my friends & family to come support me on a cold Tuesday night game in April, I promised them that I would get them on the TV broadcast somehow. This is where the idea of creating flashy fan signs was born, so I created & brought seven to that game. 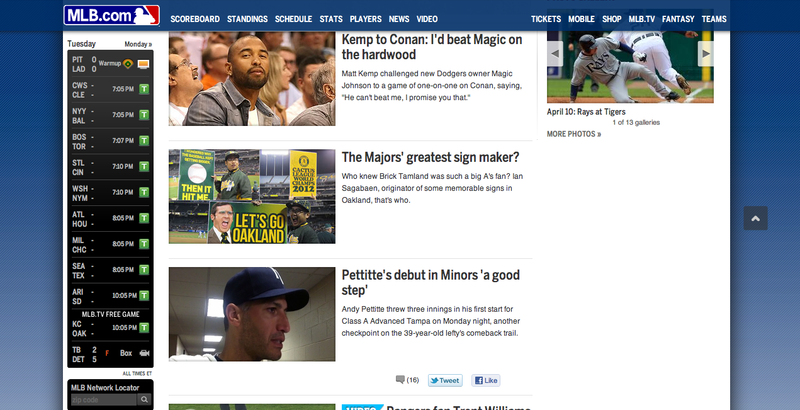 An MLB.com blog writer was roving the stands that evening & caught a glimpse of my signs. 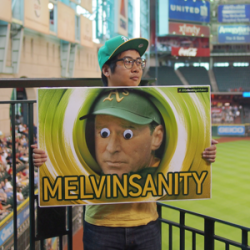 He took a photo & posted them on the Cut4 blog with the title "Ian Sagabaen has to be greatest sign-maker MLB history". The name stuck after that, so I ran with it. This does wonders for me professionally having my name ranked so high on Google when searching for the "greatest sign maker." 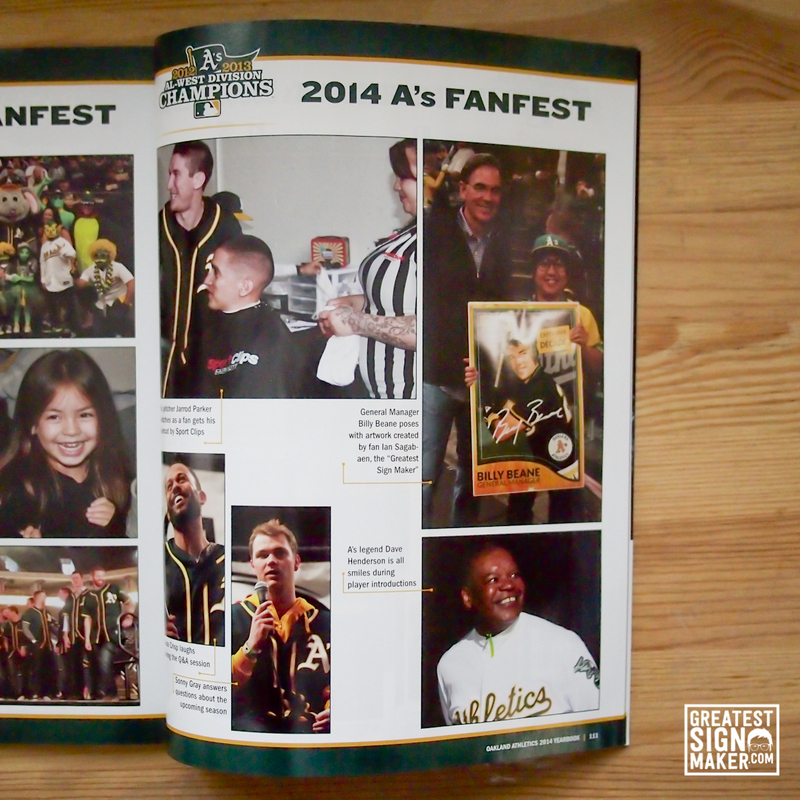 What is the best part about being a fan of the green and gold? Risk of sounding too cliché, the fan base is what makes this organization so amazing. When the Coliseum is packed, the air is electric. On those weeknight games when the crowds are thin, the atmosphere in the bleachers is usually festive & intimate. Another reason it's awesome to be an A's fan is that the club is continually being dismissed as the underdog, so it's always a great feeling to prove the doubters wrong, whether this means that the team exceeds many experts' expectations, or the puzzled reactions of non-A's fans wondering how our games are so much fun, despite our aging Coliseum that lacks the glitz of a new ballpark. Are your signs for sale? In most cases, no. Most of my sign designs use imagery that I don't own, so I can't legally make any profit on copyrighted work. Let me know if you're interested in a specific sign & I can let you know if I can sell it or not. Can I hire you to design a sign for me? The backlog has been a bit crazy recently, but if you have a sign idea for a good cause, I'm willing to consider a collaboration!